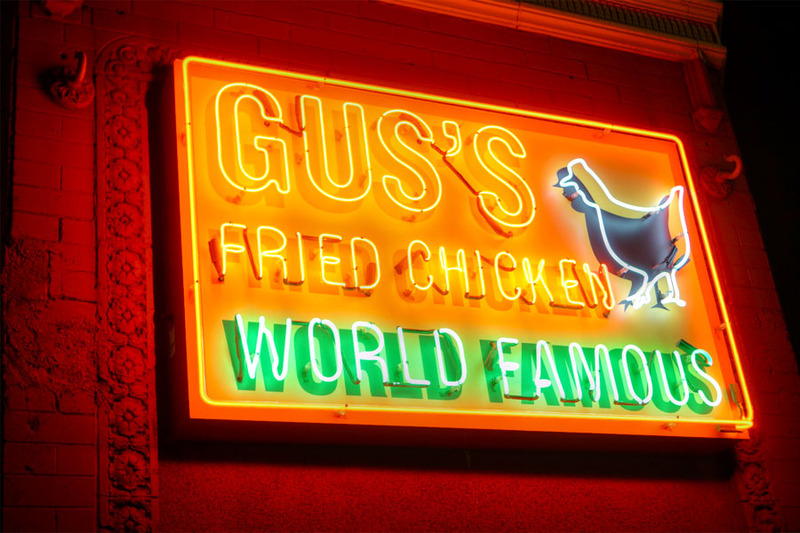 LA's fried chicken game got a shot in the arm last year with the debut of Gus's in June, the latest in a long line of fried chicken restaurants dating back to the 1950s. 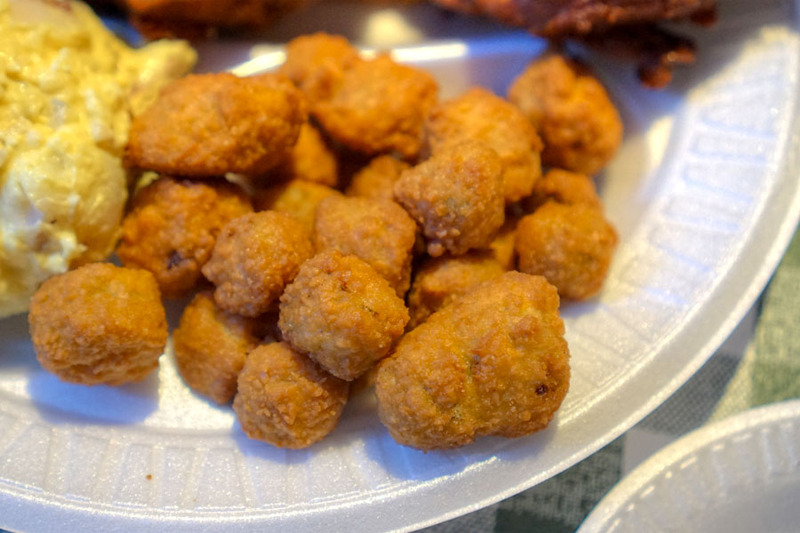 The original recipe was created in the town of Mason, Tennessee by a Napoleon "Na" Vanderbilt. He and his wife Maggie started out selling fried chicken "sandwiches" (really just the bird between two slices of white bread) at a local tavern. The couple eventually outgrew that location, and later built their own restaurant on a plot of land that they owned along US Route 70, using materials donated by local residents. 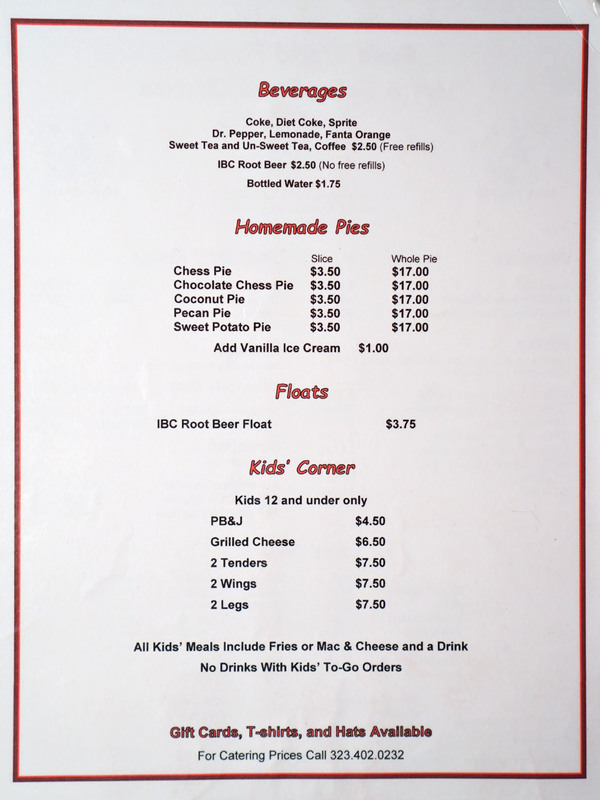 Named Maggie's Short Orders, the restaurant opened in 1973 and still stands today, serving their fried chicken. Maggie and Na passed away in 1982 and 1983, respectively, and the business was soon passed to Na's son: Vernon "Gus" Bonner. 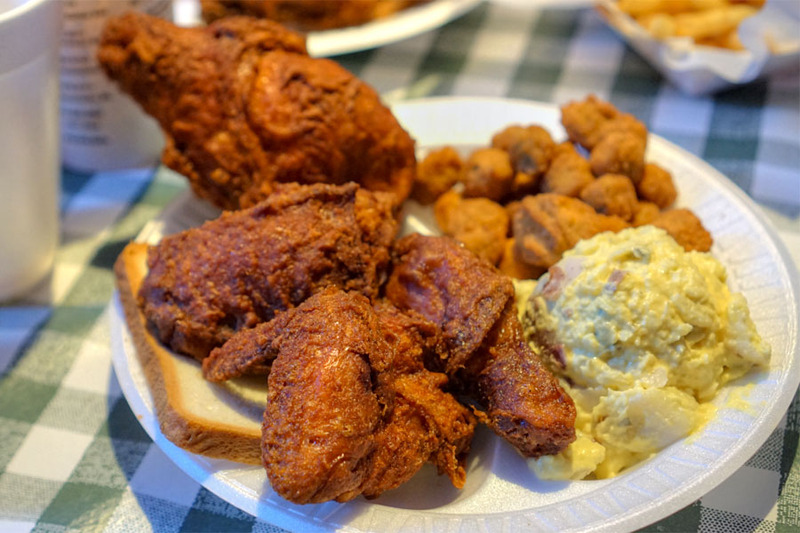 Gus and wife Gertrude re-opened the place in 1984 under the now-familiar Gus's moniker, and started to garner a following that eventually got them national-level recognition. The eatery also caught the attention of one Wendy McCrory from Memphis. She was a regular patron of Gus's, and soon started working at the restaurant on the weekends. 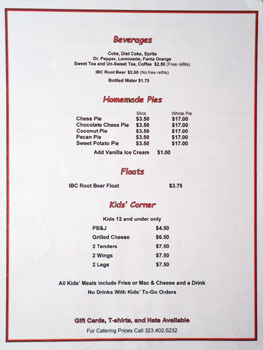 McCrory was able to secure a licensing deal with the Bonners, and subsequently opened a second location of Gus's in Downtown Memphis in November 2001. Largely driven by franchisees, she's since expanded Gus's' footprint to over 20 locations across 11 states, with LA being #20. Gus's is situated in the Coyne Building on the edge of Arlington Heights, abutting both Mid-Wilshire and Mid-City. The spot is a few doors down from the O.G. Ham Ji Park, and is a combination of two previous spaces: one of them used to be a Korean bar called Bacchus (and Club Dae Bong before that), and the other was Salon de Belleza Michoacan, a beauty parlor. Inside, things are modeled after McCrory's Memphis location, making for a fun, casual vibe appropriate for the food. 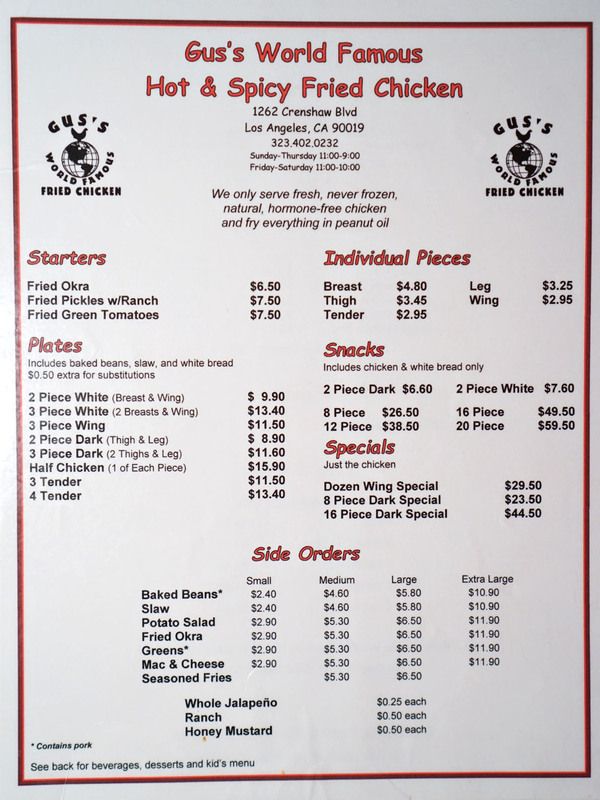 As expected, Gus's menu is centered on various combinations of chicken (note that there's only one heat level), along with suitable sides. Beverage-wise, they're mostly known for their (sweet) tea, and with a liquor license in place now, there's finally beer available by the bottle/can. Click for larger versions. 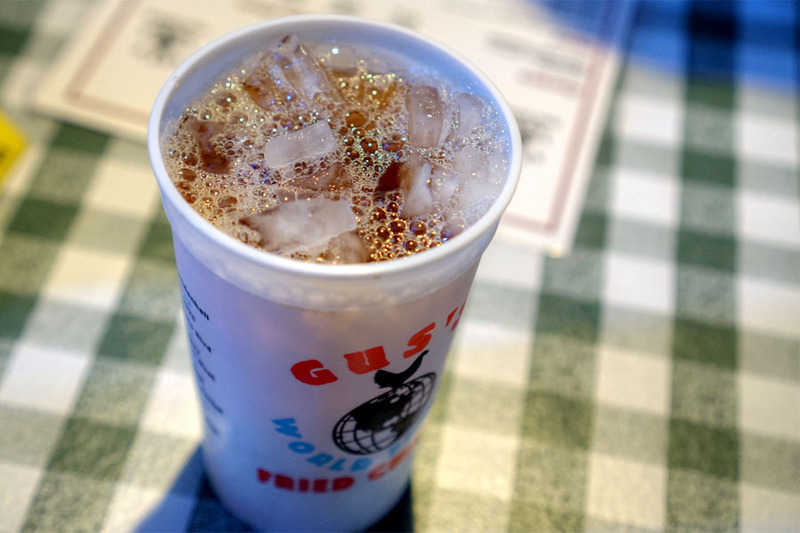 We had to try the Sweet Tea [$2.50] of course, and let me tell you, they're not shy about the sweetness. It was never overwhelming though, and the free refills were a nice touch. 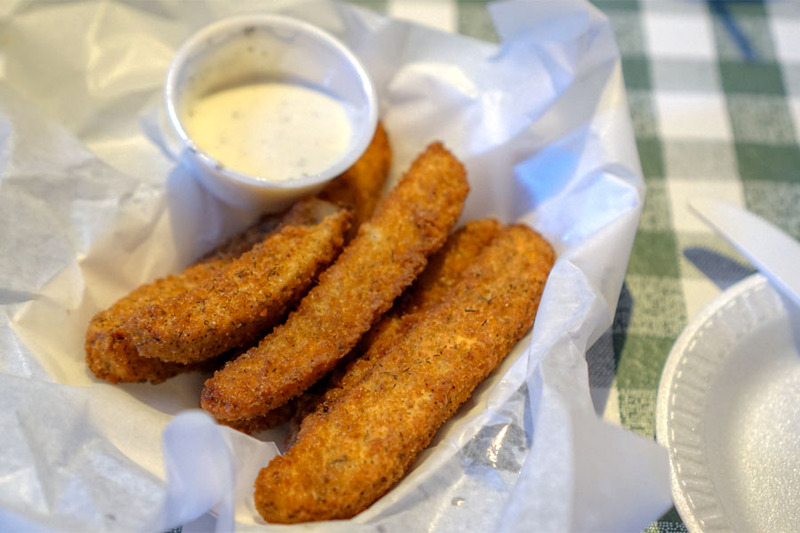 Fried pickles were almost too crunchy. They were properly tangy though, and improved with a dab of the included ranch. Let's get into the actual chicken. I'm generally a drumstick fan, so I started with that. It was damn good I'll say: super juicy, slick, soft, with a thin, crispy skin and excellent seasoning. I don't handle heat all that well, so I appreciated the spice level, which was just on the edge of making me glisten. As good as the leg was though, the thigh might've been even better. It seemed to have the most aggressive seasoning, but the bird was never overwhelmed--superbly balanced. The chicken comes with white bread as an homage to the aforementioned "sandwiches" served at the original restaurant, so you may want to use it to moderate the heat. 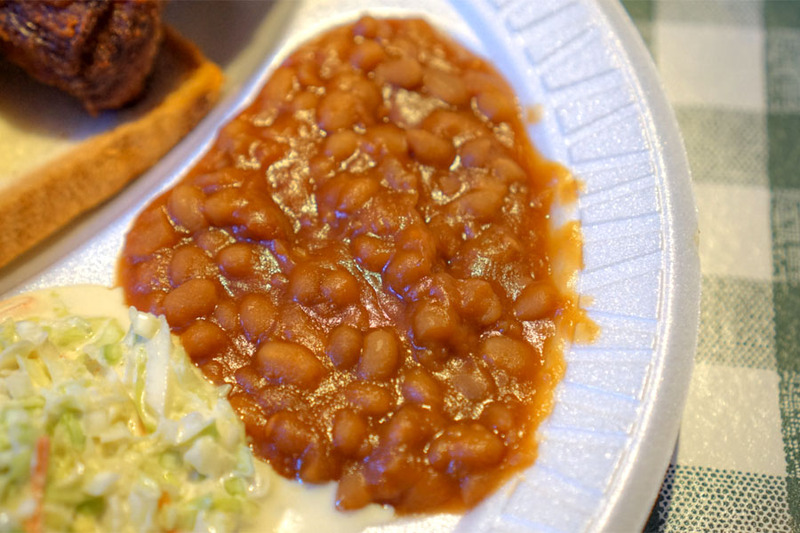 Each plate comes with a scoop of coleslaw and baked beans, though you can substitute another side for an extra charge. 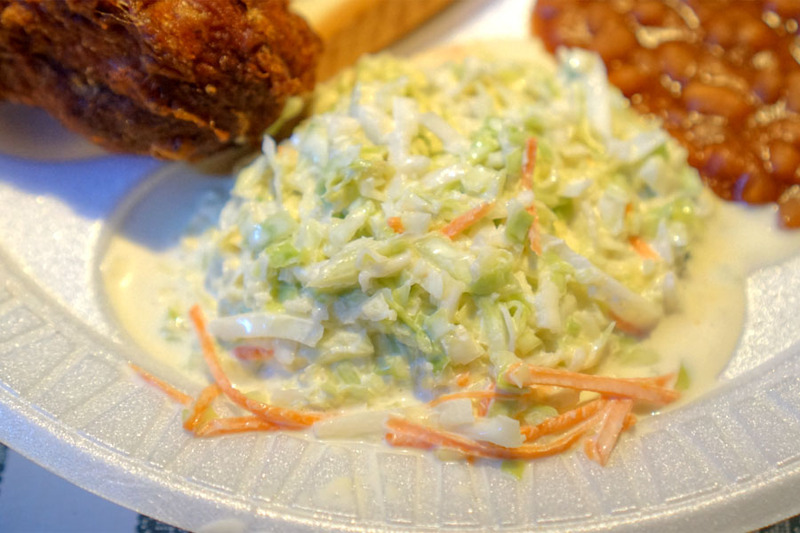 We'll start with the slaw, which I found quite creamy and slightly sweet. It did the job (especially in tempering the spice of the chicken), though I would've liked more acidity and bigger, crisper pieces of cabbage. 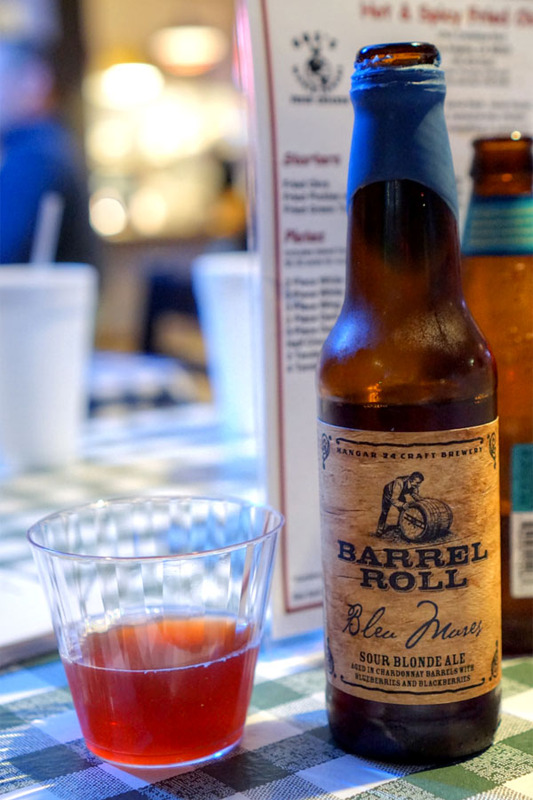 Beer-wise, we started with the 2016 Hangar 24 Barrel Roll: Bleu Mures, a sour blonde ale aged for over a year in Chardonnay barrels with blueberries and blackberries. Nose was intense, and super funky, with only traces of tart berry. The taste followed, showing off a very sour, very acidic nature laced with lots of barnyard and leather, but unfortunately not much fruit. The baked beans I found on the sweet side, though fortunately said sweetness was evened out a bit by the porky bits included. 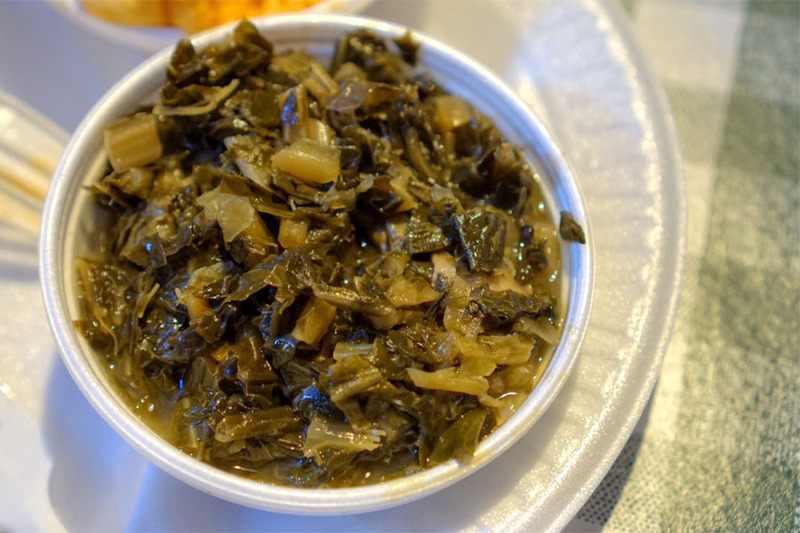 Juicy collard greens hit the spot, their deep, bitter, earthy flavors enhanced by the saltiness of more pork. With our next plate, I was able to sample the white meat. The breast was as moist, as tender as any I've had, without even a hint of dryness or toughness. Meanwhile, a higher meat-to-skin ratio meant a more chicken-focused eating experience, so you got more of the inherent goodness of the bird. 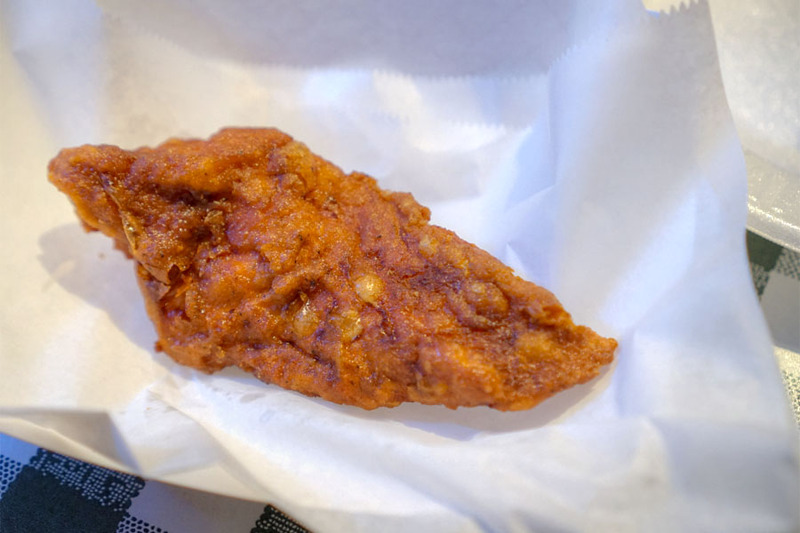 The wing, too, was a winner, coming out a bit more substantial than most, with a great balance of textures and flavors. I usually prefer dark meat, but these were right up there. Next to drink was the 2016 Phantom Carriage Cellar Blend Vol. 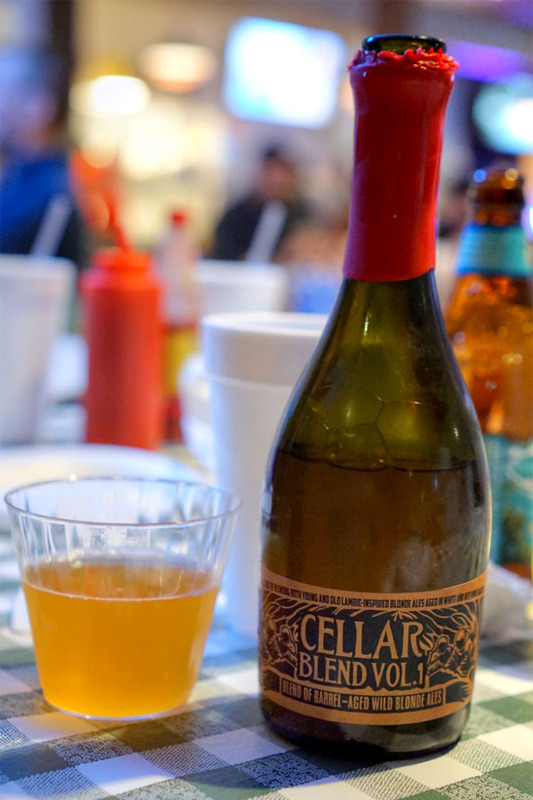 1, a bottle-conditioned blend of both young and old lambic-inspired wild blonde ales that were aged in white and red wine barrels. Aromas here were decidedly funky, with tart, lemon-y fruit to boot. The palate displayed a musty, yeasty quality alongside oaky, tart, acetic notes and more of that citrus. 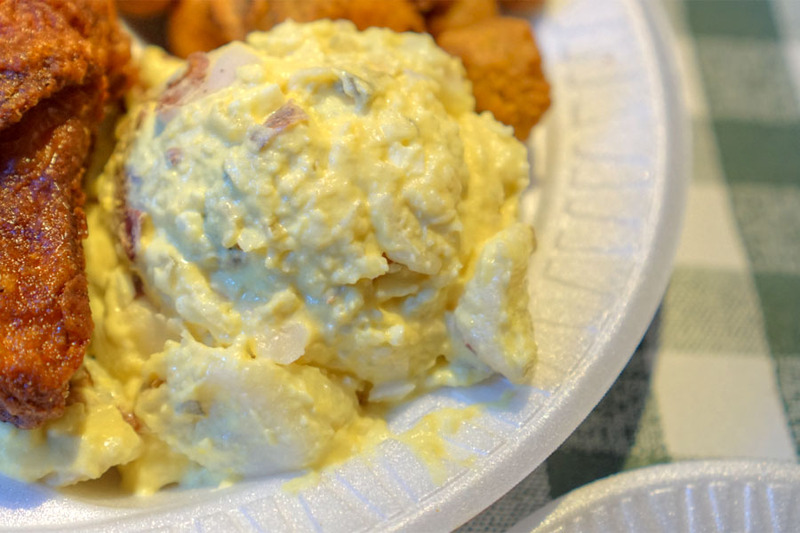 The potato salad had some lovely mustard-y notes, and I enjoyed the eggy bits inside, though I would've liked it chunkier. I'd never had okra quite like this before. I liked it though, thanks to the contrast I got between slimy and crunchy textures. 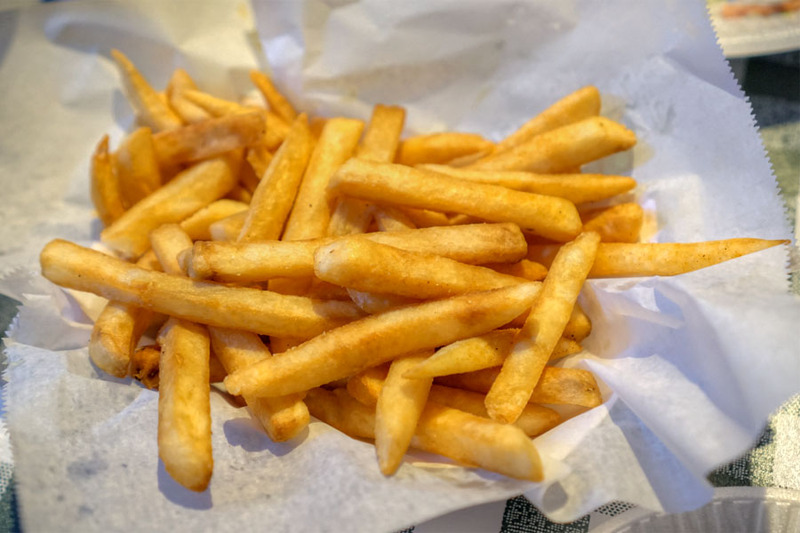 I didn't get much of the advertised seasoning, though the fries did have a marked saltiness to them. Pretty standard overall--no tricks or twists here. 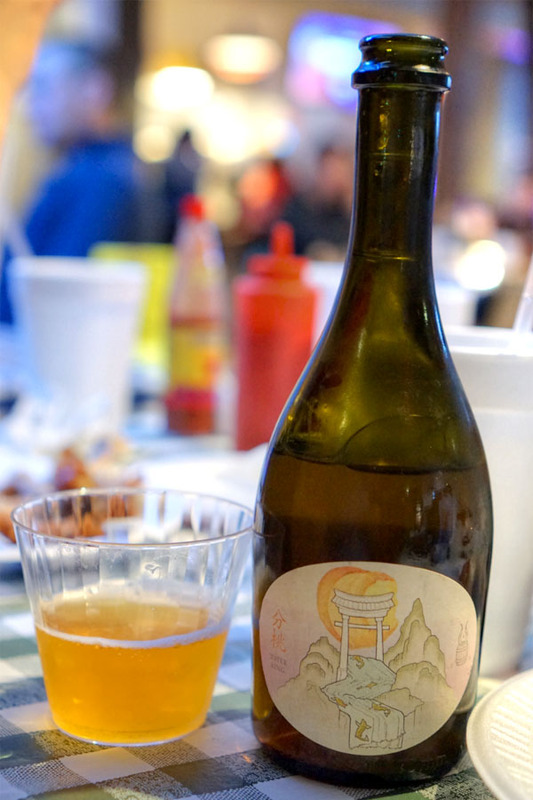 Our final beer was the 2016 Jester King Fen Tao, a barrel-aged sour ale refermented with peaches. Big aromas of sweet, juicy fruit, though not obviously peach. On the palate I got rich, in-your-face flavors of stone fruit, backed by a persistent tartness and light funk. Very tasty. The tender was easily the weakest of the five available cuts. It was easy to eat, sure, but juiciness, tenderness, and flavor all suffered compared to the pieces above. 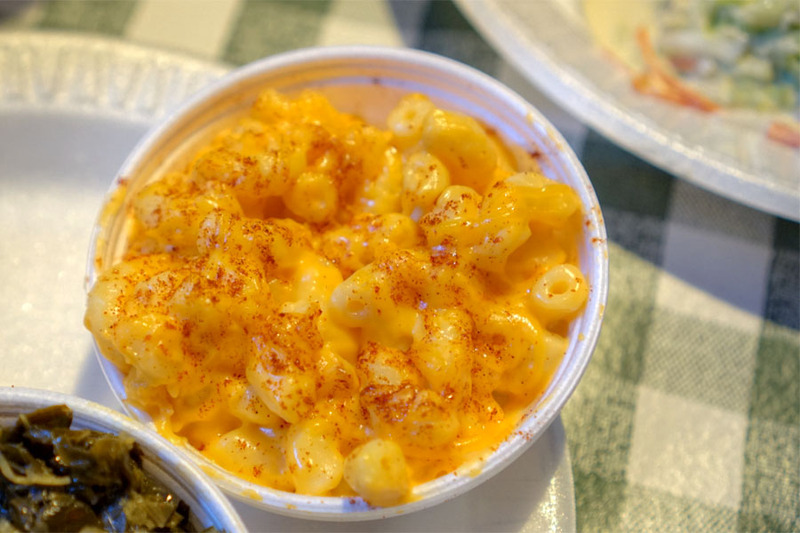 The macaroni and cheese was homey, with an almost Kraft-y character that wasn't necessarily a bad thing given its context. 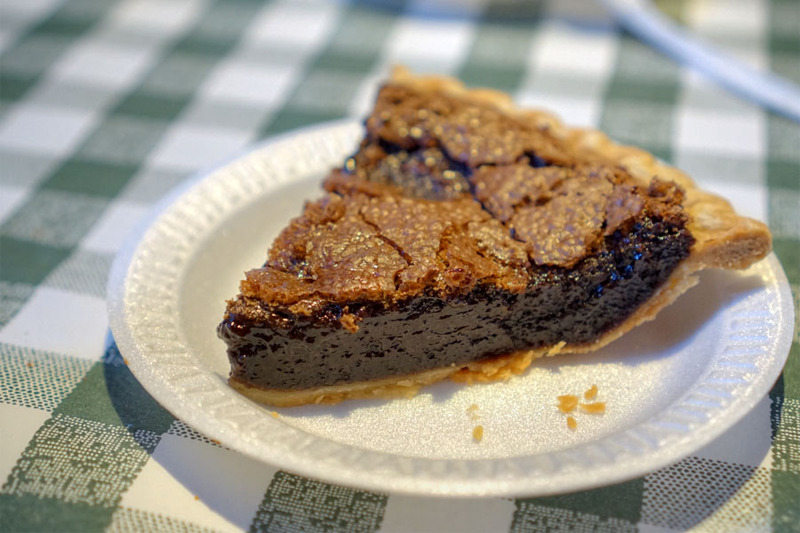 Gus's is somewhat known for their pies, so we gave 'em a shot. This one was served piping hot, and featured rich chocolate and dark fruit flavors in a gelatinous, eggy package. We requested our second pie at room temperature. 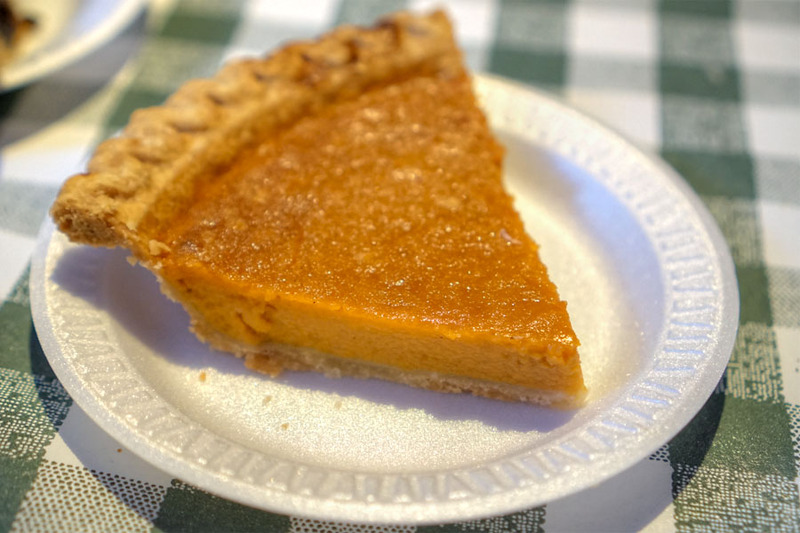 I appreciated the sweet, spicy character of this one, along with its buttery crust. Not bad. 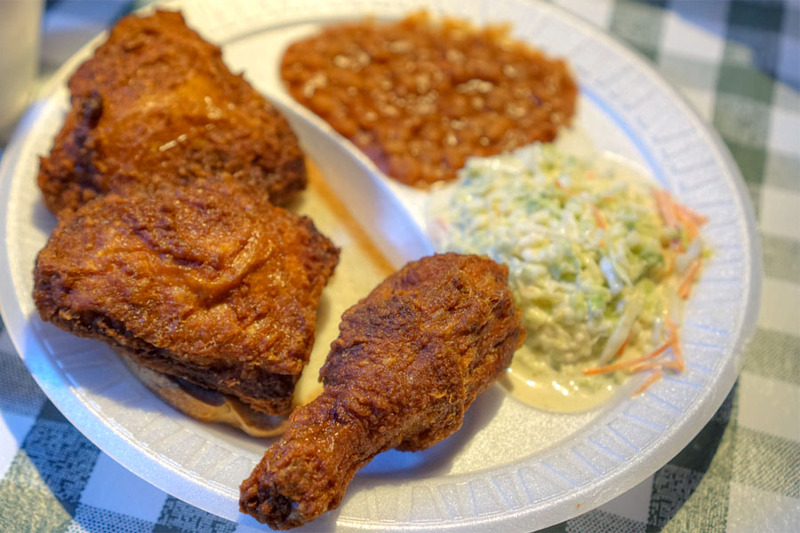 With the exception of the lone tender, the fried chicken was some of the best I've had: the bird itself is spot on, and the seasoned batter perfectly complements, but never dominates. Regarding the sides, there were some quibbles, but overall they do get the job done. As for what's next for Gus's, a second California location opened up in Burbank in mid-May, and other locations are planned for the US as well. Also on McCrory's agenda: expansion abroad to China and South America, so lots more to come. You will have to come to Austria some time. 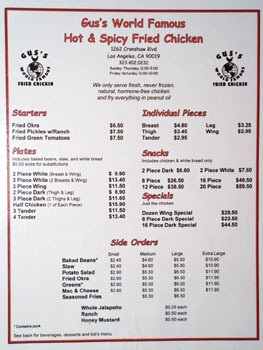 Just got back from there and they deep fry half a chicken (six pieces), plus the liver after covering the pieces in egg wash and bread crumbs. That's pretty cool. How much do they charge for those craft beers there and how many different kinds do they sell? Peter: Ah I've not had "AFC" before. It's basically backhendl I assume. Anon: Their beers are $3.75 to $4.75, but nothing too interesting (the best they had was Kona Big Wave). The ones shown in the post were brought by me. They didn't seem to mind. I was unconsciously making a connection between this restaurant and Gus Fring (of Breaking Bad) for 5 minutes and it just felt like something is really off until I consciously acknowledge this link. Haha. The chicken looks good! Around 3 years ago i was at Los Angeles, CA because of the company board meeting, that time I had some spare time and I was visiting the city. I was hungry and I ordered the same mentioned place listed in the article, the food is good. The ambience is quite good looking. I and my team was there because a WordPress website development company approached us to convert some PSD to WordPress theme. I and my team were really happy, and we all party together. I am amazed to see the place, everything is more than beautiful. Beautiful place, beautiful people and everything was really really good. Thanks.